Storing kitchen knives is always actual. Some people buy them one by one, and when not in use, the knives jangle inside a drawer getting dull and nicked. Other people store an enormous set of nine or ten kitchen knives, six steak knives, scissors, and a sharpening steel in a huge angled knife block on the countertop. 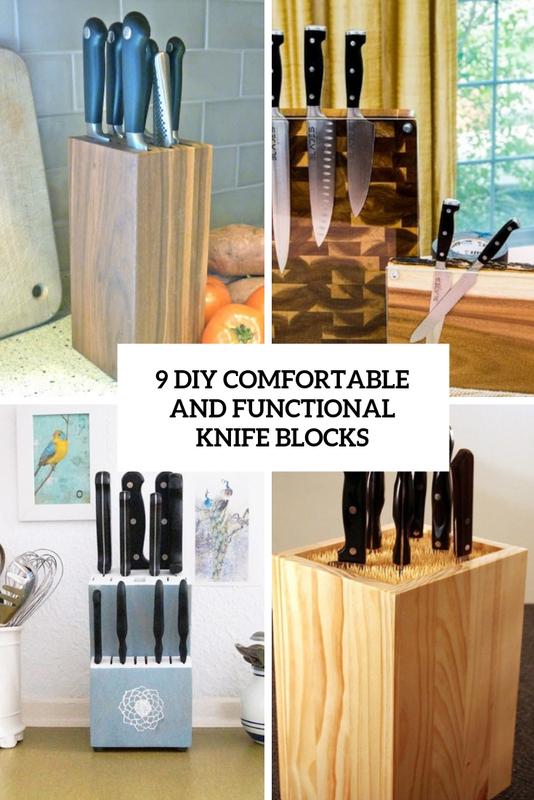 If you need a cool block to store all the knives you are using now, here are some cool tutorials you may use. 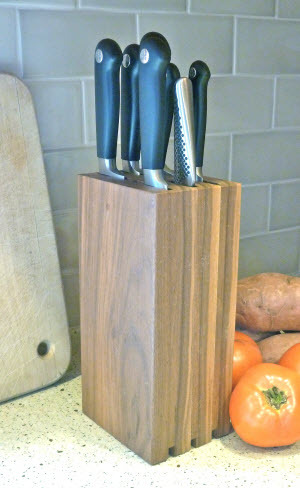 This cool knife block design takes up less countertop space and shows off the natural beauty of dark walnut wood. The piece is really simple: four vertical boards separated by ten strategically placed dividers. The dividers are shorter than the verticals so there is room to facilitate evaporation in case a knife is inserted wet after washing. It would be easy to make three or four of these in an afternoon, reserving an additional afternoon for finishing. You can make your own knife block using offcuts of PAR pine or meranti and have a practical knife block that holds all kitchen knives for easy access and also out of harms way if there are young children in the house. 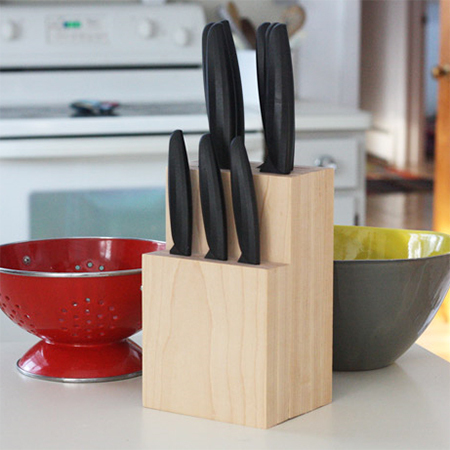 This easy knife block is also a great DIY gift idea. Read the tutorial to make and finish it and enjoy crafting! 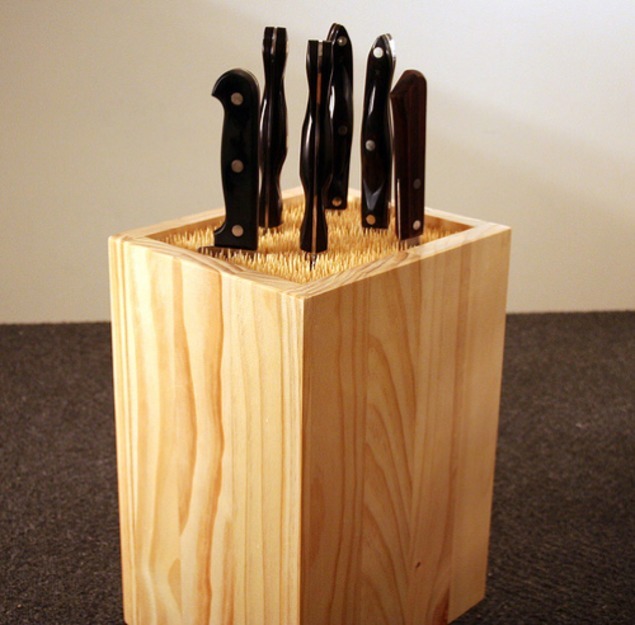 Make this simple knife block on the cheap! Roll up your sleeves and make your own version of such a block, take some pine shelves, bamboo skewers to fill the box and go! The end result is a knife block that you can stick any knife into, very similar to the extremely expensive commercial version. The main advantage is that any new knife will easily fit the block without any problems. 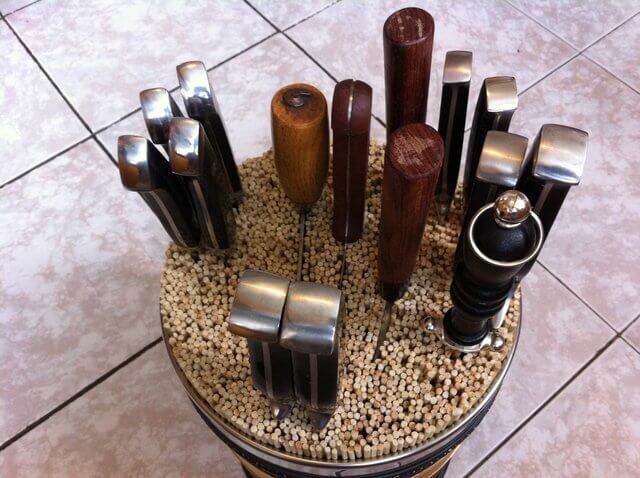 Want a knife block you can doodle on? Even a plain knife block will look much more modern with chalk paint and it will fit with the other black accessories in the kitchen. 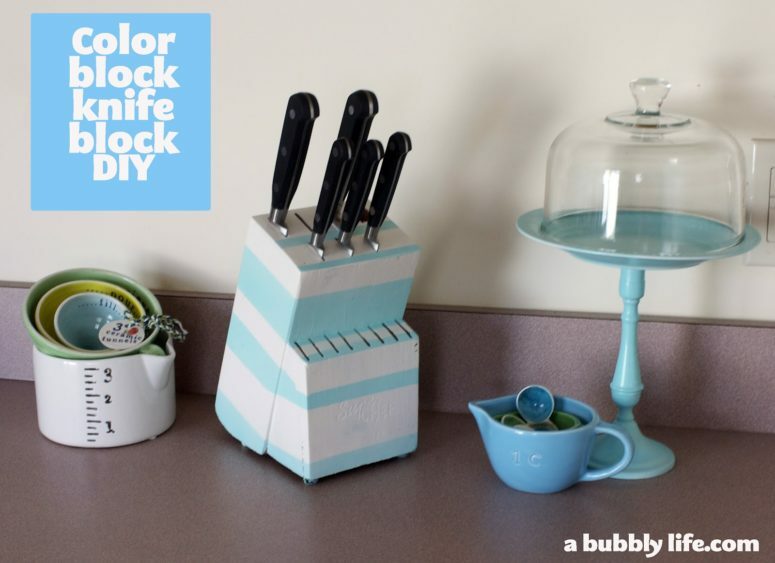 Here’s how you can easily re-paint your knife block, using chalkboard paint. Decorate it with chalk after! 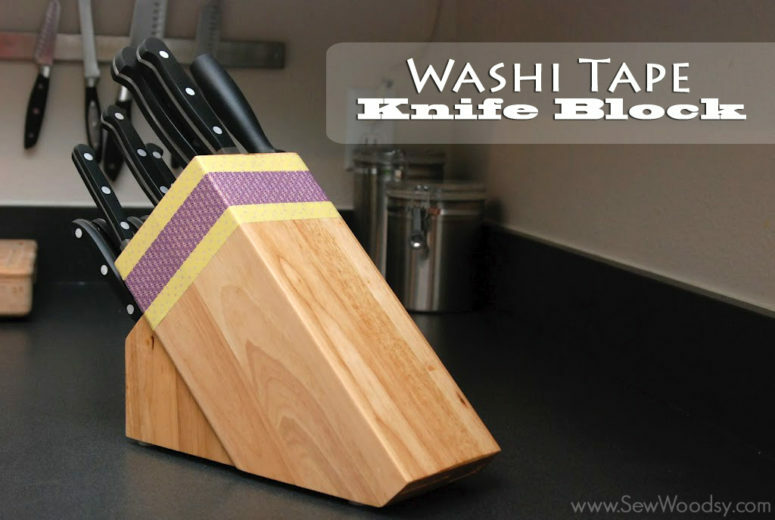 Here’s another project to spruce up a usual knife holder, this tutorial is much easier than the previous one as here we are using washi tape. Take the washi tape you like and decorate the block as you want to achieve a cool look. Enjoy! Color blocking is a very popular way to work with color, it gives a modern and fresh feel to your space immediately. This tutorial will tell you how to make your existing knife block bolder and more modern using paints – go for color blocking you like. Use the schemes from the project or go for different ones to build up a bold piece. 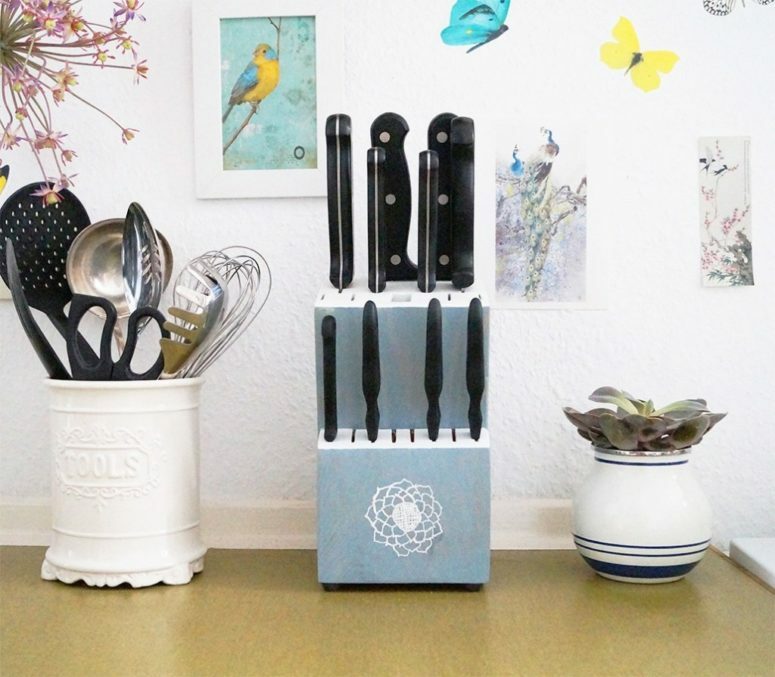 Here’s a cute and bright knife holder, the tutorial in German will tell you how to craft it first and then to paint it and add patterns if you want. 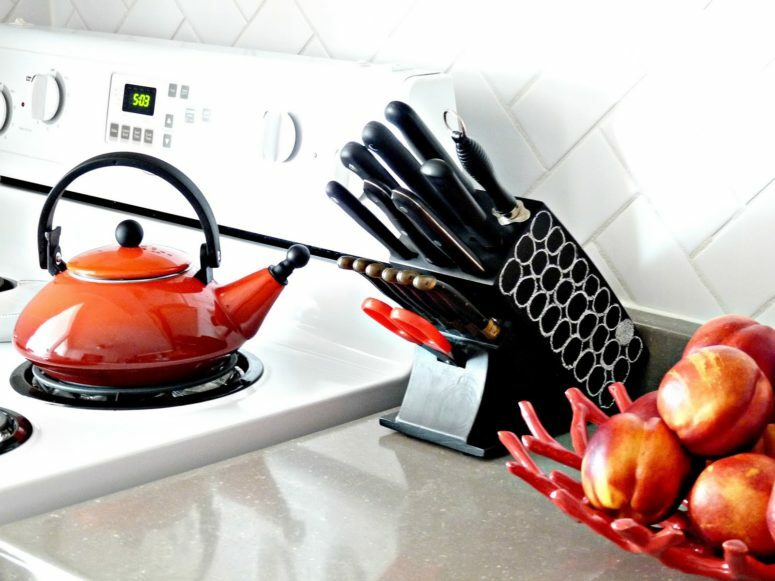 Choose the colors and images that match your kitchen decor and make your knife block perfectly fitting. Get inspired and go crafting! Go for a universal knife holder and you won’t worry if your new knife fits it or not! This tutorial will tell you how to make a universal knife holder of a large tin can and wooden skewers, which guarantee that your knives will be in place. What would you say to a transparent knife block? I’d say very modern, bold and comfortable! 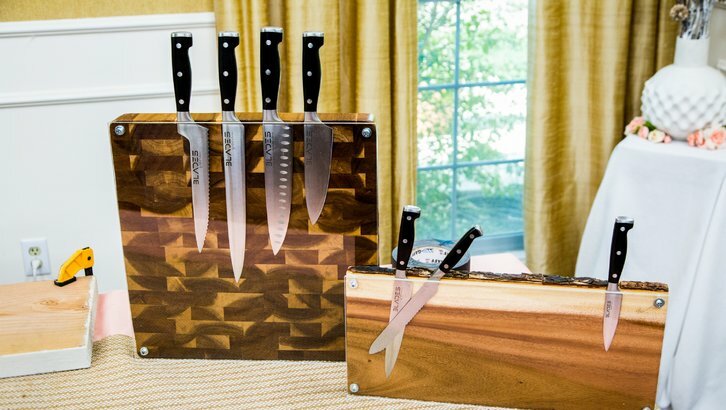 These cute knife blocks are made of cutting boards and plexiglass, which means that you’ll see what knife you are pulling out and each new knife will find its place here. Read the project and get inspired!